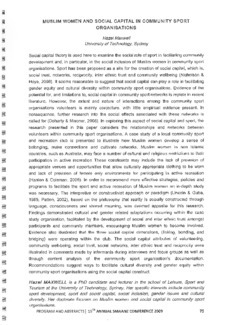 Social capital theory is used here to examine the social role of sport in facilitating community development and, in particular, in the social inclusion of Muslim women in community sport organisations. Sport has been proposed as a site for the creation of social capital, which is, social trust, networks, reciprocity, inter ethnic trust and community wellbeing (Nicholson & Hoye, 2008). It seems reasonable to suggest that social capital can play a role in facilitating gender equity and cultural diversity within community sport organisations. Evidence of the potential for, and limitations to, social capital in community sport networks is replete in recent literature. However, the extent and nature of interactions among the community sport organisations volunteers is mainly conjecture, with little empirical evidence present. In consequence, further research into the social effects associated with these networks is called for (Doherty & Misener, 2008). In exploring this aspect of social capital and sport, the research presented in this paper considers the relationships and networks between volunteers within community sport organisations. A case study of a local community sport and recreation club is presented to illustrate how Muslim women develop a sense of belonging, make connections and cultivate networks. 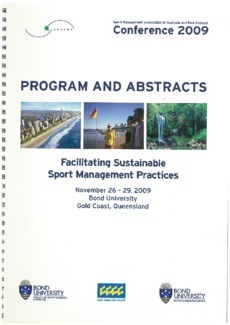 Muslim women in non Islamic countries, such as Australia, may face a number of cultural and religious restrictions to their participation in active recreation These constraints may include the lack of provision of appropriate venues and opportunities that allow culturally appropriate clothing to be worn and lack of provision of female only environments for participating in active recreation (Hanlon & Coleman, 2006). In order to recommend more effective strategies, policies and programs to facilitate the sport and active recreation of Muslim women an in-depth study was necessary. The interpretive or constructivist approach or paradigm (Lincoln & Guba, 1985; Patton, 2002), based on the philosophy that reality is socially constructed through language, consciousness and shared meaning, was deemed apposite for this research. Findings demonstrated cultural and gender related adaptations occurring within the case study organisation, facilitated by the development of social and inter ethnic trust amongst participants and community members, encouraging Muslim women to become involved. Evidence also illustrated that the three social capital dimensions, (linking, bonding, and bridging) were operating within the club. The social capital attributes of volunteering, community well-being, social trust, social networks, inter ethnic trust and reciprocity were illustrated in comments made by informants during interviews and focus groups as well as through content analysis of the community sport organisation's documentation. Recommendations suggest ways to facilitate cultural diversity and gender equity within community sport organisations using the social capital construct.